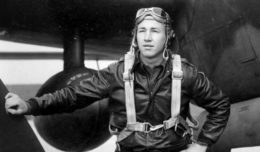 Gen. Robert B. Brown, commander, U.S. Army Pacific, speaks about multi-domain battle at The Association of the United States Army Institute of Land Warfare-sponsored “Land Forces in the Pacific: Advancing Joint and Multi-National Integration” symposium, May 23, 2017 in Honolulu, Hawaii. During a recent military exercise with Australian soldiers, it took them two hours to establish connectivity with U.S. systems, said Gen. Robert B. Brown. Be it a technology issue or a policy issue, that’s just one small example of the challenge of getting to multi-domain battle, or MDB, a concept that encourages units to engage the enemy in all domains — air, sea, land, cyber, space — in the context of a joint, multinational combined effort, he said. 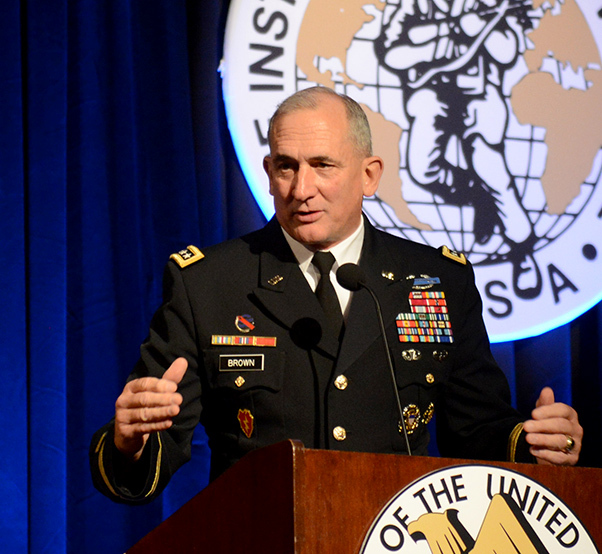 Brown, commander, U.S. Army Pacific, spoke at The Association of the United States Army Institute of Land Warfare-sponsored “Land Forces in the Pacific” symposium: “Advancing Joint and Multi-National Integration,” May 23. People in each of the services “grew up in stovepiped” organizations, he said. Each service has its own unique systems that often don’t communicate with other systems and each person is indoctrinated in separate service cultures — a different type of stovepiping. This all needs to change, he said, because the world is rapidly changing. The internet is connecting more people together than ever before and bad actors are using that connectivity to spread lies, rumors and chaos, he said, citing an example of the latter in the so-called “wanna cry” ransomware virus that spread a week ago. During the end of World War I, for example, the Spanish Flu pandemic put countless soldiers out of the war on the Western Front in Europe, he said. That would be another example of a black swan event. Adm. Scott H. Swift, commander, U.S. Pacific Fleet, agreed that stovepiped systems that don’t communicate are rampant. Rather than wait for a real war to occur with a near-peer adversary, the best that can be done for now is participate with allies and sister services in exercises, RIMPAC being a prime example, Swift said. By working through issues in those exercises, it readily becomes apparent which systems are talking to other systems and which ones are not. “I want weapons systems that can reach out and touch,” he said. Yet, there are too many disparate systems that are not interconnected, he said, giving a long list from radars to missile systems. Swift added that it’s important for Soldiers all the way down to the E-1 level to understand the importance of MDB and to think of solutions in a joint context with sister services and multinational partners. Gen. Terrence O’Shaughnessy, air component commander, U.S. Pacific Command, said the message hasn’t gotten through yet, as services continue purchasing systems that can’t communicate with other systems. 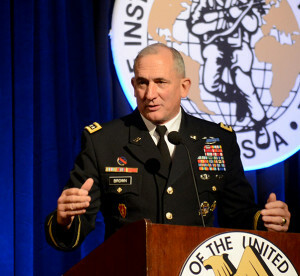 He encouraged AUSA attendees, some of whom are from industry, to build systems that connect. Maj. Gen. Daniel D. Yoo, commander, Special Operations Command Pacific, said that once systems are able to communicate with each other, then leaders can operate in a more decentralized fashion and leverage the capabilities within each of the domains, irrespective of which service owns them. Gen. David G. Perkins, commander, U.S. Army Training and Doctrine Command, said that the good news is that once technological and policy issues are resolved, and systems communicate to each other, the beauty of MDB will become clear. MDB will allow brigades to utilize multiple domain options with multiple partners to keep the enemy guessing and ineffective, he said. Perkins added that the policy and technology pieces will come later. For now, he said the best weapon in the Army is the Soldier who is adaptable and able to operate independently within the parameters of the commander’s intent. Gen. Rajendra Chhetri, chief of the Army Staff, Nepalese army, said his nation participates in numerous multinational exercises that include the U.S. He said it would be beneficial if all of the communications systems were standardized. During the 2015 quake, he said his army circumvented the interconnectivity problem by using cellphones. The problem with that is that they are not secure. Besides interconnectivity problems, there are language barriers as well, he added. The Chinese pilots who helped with the humanitarian effort didn’t speak Nepalese or English, so they couldn’t communicate with the tower. In addition to participating in multinational exercises, Chhetri said he is proud that his little country is the sixth-largest contributor to UN peacekeeper missions, including those in Syria, Libya and South Sudan.